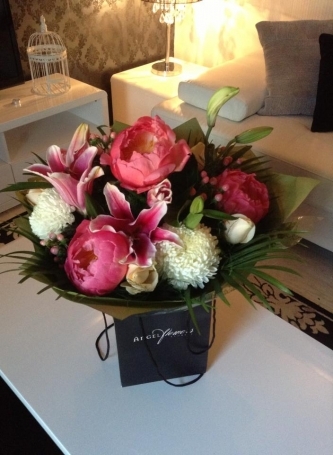 "The nicest flowers she got in all her time in Perth"
I just wanted to thank you so much for the beautiful flowers you delivered to my sister for me. She said they are the nicest flowers she got in all her time in Perth. They gave her such a lift and your delivery lady was especially cheery. 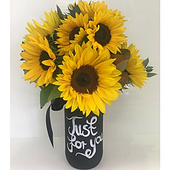 "Many florists do not deliver to Bullsbrook or even recognise the post code"
I just wanted to say thank you for the beautiful flowers my Mother received. She loved them! 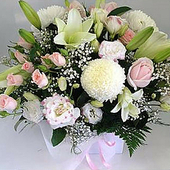 Many florists do not deliver to Bullsbrook or even recognise the post code so I appreciate the reasonable delivery fee. I will definitely be recommending you to my family and friends. "Will definitely spread positive words about you"
She just received them. Thank you so much! Will definitely spread positive words about you. I have heard they have been delivered and are lovely. 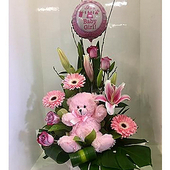 "beautiful bouquet for Miss Global Australia 2015"
The beautiful bouquet for Miss Global Australia 2015 has just been delivered by Angel Flowers How stunning are they!!! 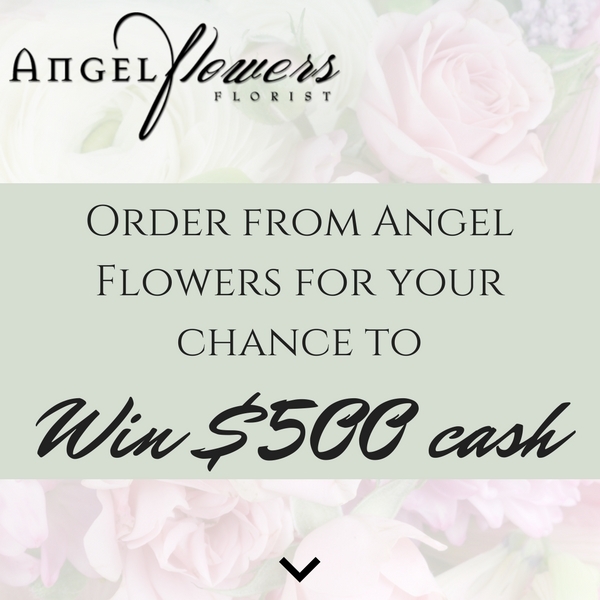 A beautiful reason to use Angel Flowers this Mother's Day. Absolutely gorgeous! "everyone commented how lovely they were"
I just wanted to say a huge thank you for the flowers, both for the wedding party and the reception. They were exactly what I wanted and everyone commented how lovely they were. The peach roses were great too!!!! Thank you for all your patience, help and care. It was very much appreciated. 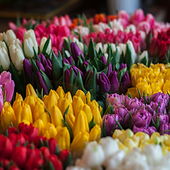 "Lovely flower shop, lovely staff and good prices!" Absolutely the most creative, thoughtful, reliable, fabulous florist in Perth - please open in Claremont/Dalkeith!!!! 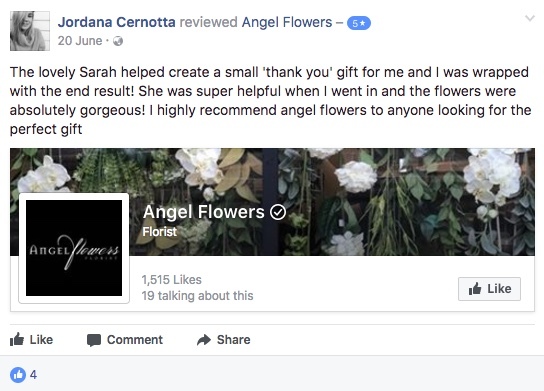 "The blooms are gorgeous (apparently everyone was commenting)"
"it looked just as I had hoped absolutely beautiful!!" Just wanted to say a huge thank you for the beautiful jar of choccies you delivered to my sister in law this afternoon - she sent me a pic and it looked just as I had hoped absolutely beautiful!! Ordered last night and delivered today - thank you so much I was so worried about it, will be using you guys every year from now on!! Thank you so much for the efficient delivery today, my friend absolutely loved her flowers. Just wanted to say a big thank you for the gorgeous flowers that were delivered. They were absolutely stunning and my mother-in-law was so surprised. Thank you for the great service your system notification is great. I was talking to my sister on the phone when her flowers were delivered!! She was overwhelmed!! Said they were absolutely gorgeous!! Thank you so much for helping her to feel special on her 50th birthday. They are absolutely stunning. Thank you very much! Really pleased. Wonderful communication all the way through, I saw the flowers, beautiful thank you. "loved the Beautifully presented gift"
"The bouquet was exactly what we wanted"
Thought I would send a photo of all of us for your collection. I have had many compliments about the flowers. 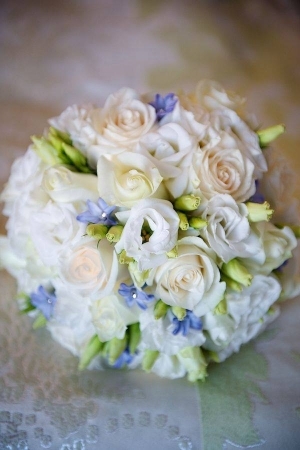 The bouquet was exactly what we wanted and came up beautifully in our photos. 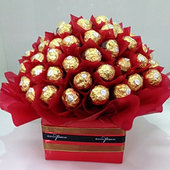 "It really made the room, and contributed to the night being such a success"
I just want to send a quick email to let you know how happy I was with the chocolate bouquets, hampers and flower arrangements. It really made the room, and contributed to the night being such a success. "stunning bouquet which is filled with the beautiful perfume"
Last night my amazing boyfriend surprised me with this stunning bouquet which is filled with the beautiful perfume from the orientals. I'm a florist my self and have always made bouquets this big but never have I received one till last night and WOW how good does it feel to be given one from someone who truly loves me! My 2nd bouquet from #angelflowers Beautiful work girls! 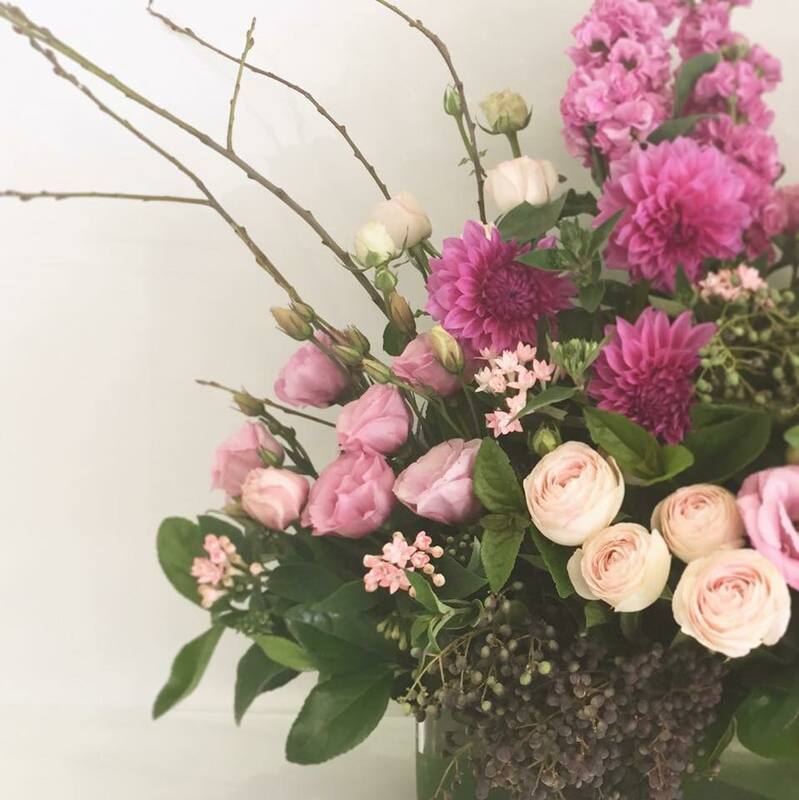 "words can't describe how beautiful Amy's flowers were"
A very big thank you to Susan and her team, words can't describe how beautiful Amy's flowers were. Just perfect for a perfect bride. 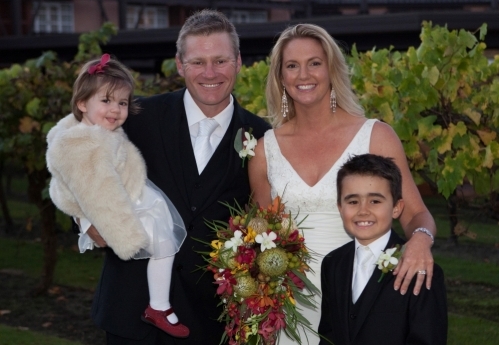 "it was more beautiful thn I thought it would be"
I just wanted to say thankyou to Susan and the girls at angel flowers for our bouquets and corsages for our wedding! 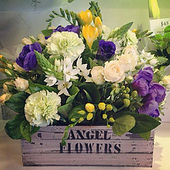 "You have very quick service and delivery"
To Angel Flowers, I just would like to thank you very much for the delivery you made for me yesterday to Cloverdale. You have very quick service and delivery. The flowers were absolutely gorgeous and fresh. The presentation was so lovely and I just wanted to send you many thanks. "They were so AMAZING, was one of the highlights of the day"
Just wanted to say a HUGE Thank You for all my flowers on the 10th Jan. They were so AMAZING, was one of the highlights of the day when they were delivered. I loved them!!! As did everyone else…..! 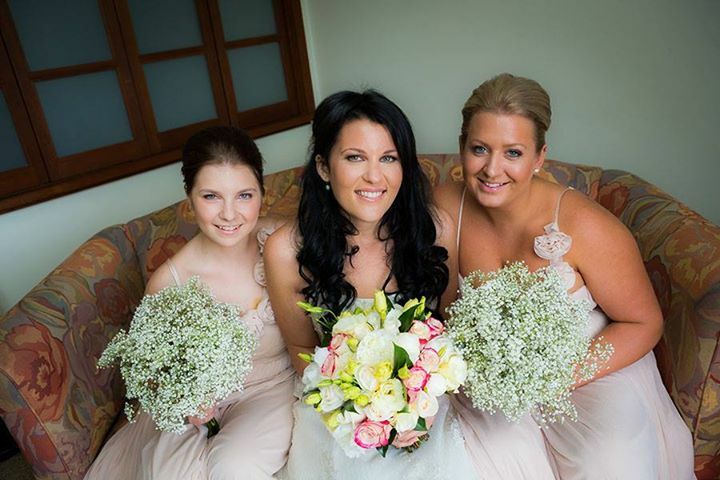 "They looked amazing, everyone commented on the bouquet and posys"
Thank you for all that you did with the flowers, they looked amazing, everyone commented on the bouquet and posys. Thank all your staff would always recommend you. 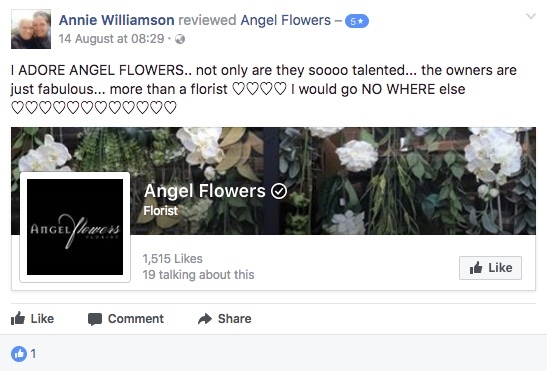 "They understood exactly what we wanted and provided it"
"Angel Flowers came to the flower rescue the week before the wedding and produced absolutely beautiful flowers. They understood exactly what we wanted and provided it. 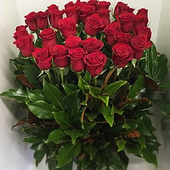 Very reasonable prices and fantastic service"
Thanks for sending beautiful flowers this morning. Much appreciated." "We love using your florist"
"Thank you so much. 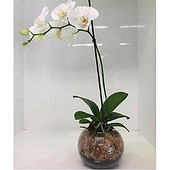 We love using your florist as we receive many compliments from the recipients and your staff are always so friendly and helpful. So, thank YOU for a wonderful service! Have a great day,"
"Thanks again for your wonderful service." 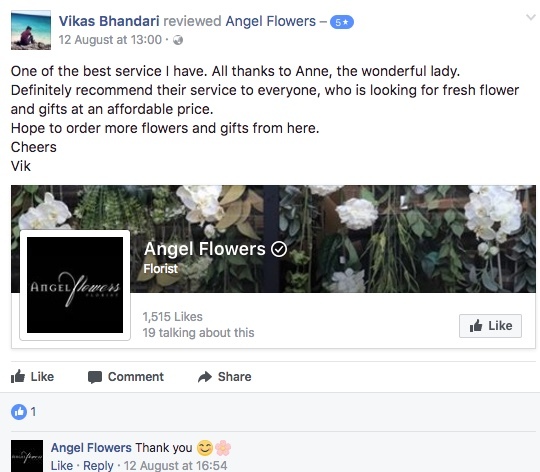 "Angel Flowers have been a lifesaver"
"Good afternoon Maria, Thank you for your help this afternoon, you have been a lifesaver :)"
"Hi Maria, Thank you for looking after us again." 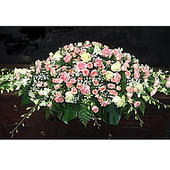 "Mum absolutely loved her flowers... Thank you!" "Hi Maria Thank you so much for all your help with this order, I couldn't have done it without you!" 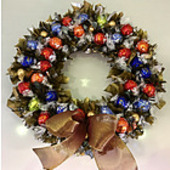 "Hi Maria, She received them and the reaction was worth every cent, well priceless. I really appreciate your assistance. Enjoy your weekend. "flowers are always lovely and last very well also"
"Thank you. 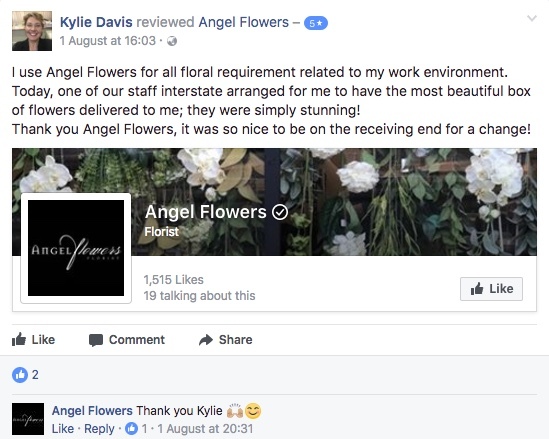 I always buy my flowers from you and have been caught up at work so thought of the internet to locate you and found the process user friendly. 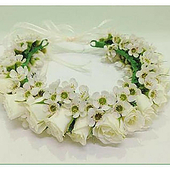 So thank you- your flowers are always lovely and last very well also." "I would recommend you guys to all my friends and family!" "I have just phoned to get a hamper delivered to Bunbury and no problems"
"Good afternoon Susan, Once again I have had fabulous service from your staff and as my partner has been in hospital twice and each time the flowers and hampers have been a great talking point from the nurses who have said the are beautiful plus my partner loves them, now I have just phoned to get a hamper delivered to Bunbury and no problems." "Everything went to plan and the flowers looked beautiful"
"Hi Susan Just wanted to send a quick thankyou for preparing our flowers on our wedding day. Everything went to plan and the flowers looked beautiful. Everyone commented on how beautiful they looked. My poses and the reception's centrepieces were amazing. We cant thankyou enough for helping make our wedding day perfect in everyway. Thanks again"
"Thanks for all your help with my questions"
"Hi, Thanks so much for sending this through and for all your help with my questions etc. Your service has been excellent and I'll be recommending you to my friends and family!" "I have never seen such a beautiful arrangement!" "To Sophie and the team, Terry and myself would like to say a huge thank you for all you hard work and effort that went into our wedding flowers, they were absolutely stunning! I have never seen such a beautiful arrangement and were 100 times better than I could have imagined! Sophie, you did so well and came out on top, thank you so much. Also thankyou so much for all the time you had for me, I think I may have made about 50 phone calls to you overall and you always had time to speak to me. I have absolutly no hesitations on recomending you to others because I hope somebody else can be as happy as I was with your service. Thanks again"